Mac Miller’s parents, Mark McCormick and Karen Meyers, will attend the 2019 Grammy Awards ceremony and will accept the Best Rap Album award on his behalf of their son, if he wins. In December 2018, Mac received a posthumous nomination for his fifth album Swimming – his first Grammy nomination – three months after he died from an accidental overdose at the age of 26. Mac’s Swimming is up against some other big names, including Travis Scott’s Astroworld, Cardi B’s Invasion of Privacy, Pusha T’s Daytona and Nipsey Hussle’s Victory Lap. If Mac, born Malcolm McCormick, wins the award for Best Rap Album, he will become the first ever artist to receive a posthumous win in the category. Swimming reached number three in the Billboard charts following its August 2018 release. After Mac’s death in September 2018, the album returned to the top 10. Sources told TMZ how Mark and Karen will represent their son at the Grammy’s, and plan to accept the award should he win. Since their son’s death, Mark and Karen have worked to honour his legacy through The Mac Miller Circles Fund, which provides ‘programming, resources and opportunities to youth from underserved communities’ in the Pittsburgh area. The fund has so far raised nearly $1 million, helping children and young people to ‘recognize their full potential through exploration in the arts and community building’. If Mac Miller wins the Grammy for best rap album I’m going to cry my eyes out and get a tattoo in his honor. This Saturday (January 19) would have marked Mac’s 27th birthday, and DJ Clockwork is throwing a ‘tribute birthday party’ in remembrance. When my guy @dblj05 sent me this artwork i stared at it for like 30 mins just really accepting the reality my boy is gone. His birthday is this Saturday (1.19) and like we have done in the previous years on macs bday, we celebrate.. LOUD. I wanted to do something in ReMembrance of his day that the whole city of new york can enjoy. He loved NYC, he moved here like a year after me. Just him and I living in Brooklyn exploring the city. So this Saturday @sunnyvalebrooklyn the whole night is dedicated to @macmiller. Ill also be giving proceeds to the @tmmcf. Playing all his classic and rare records & even songs that he liked to party too. Tix for party in bio shout out all the #macheads and his fans and most importantly his family. 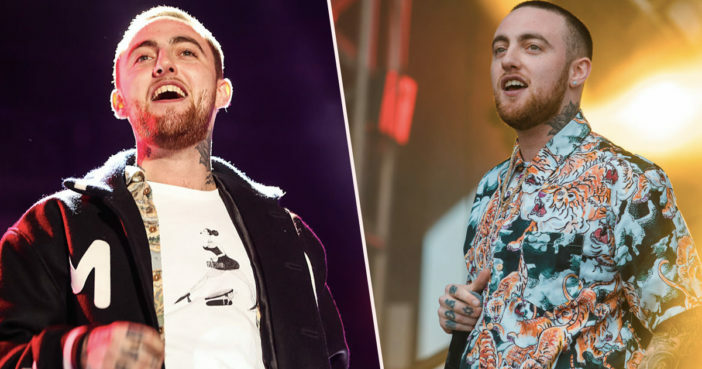 Mac Miller was found dead in his San Fernando Valley home on September 7 from an accidental overdose. He was 26 years old. Our thoughts are with Mark McCormick and Karen Meyers as they prepare to attend the ceremony on their son’s behalf. The 61st Annual Grammy Awards will take place Sunday, February 10. You can make a donation to The Mac Miller Circles Fund using the online donation form.